Julia Riordan is an artist based in Stockholm, Sweden, who discovered her passion for crochet and knitting at the age of 10. Julia has since launched her own environmentally friendly knitwear label, specializing in unique, colourful beanies. Her crochet obsession took over and before she knew it she was creating yarnbombs even so far as New York. Yarn bombing is a type of graffiti or street art that employs colourful displays of knitted or crocheted yarn or fibre rather than paint. While yarn installations – called yarnstorms – may last for years, they are considered non-permanent, and, unlike other forms of graffiti, can be easily removed if necessary. Yarn bombing was initially almost exclusive to colder cities during winter as a way of reclaiming and personalizing sterile or cold public places. 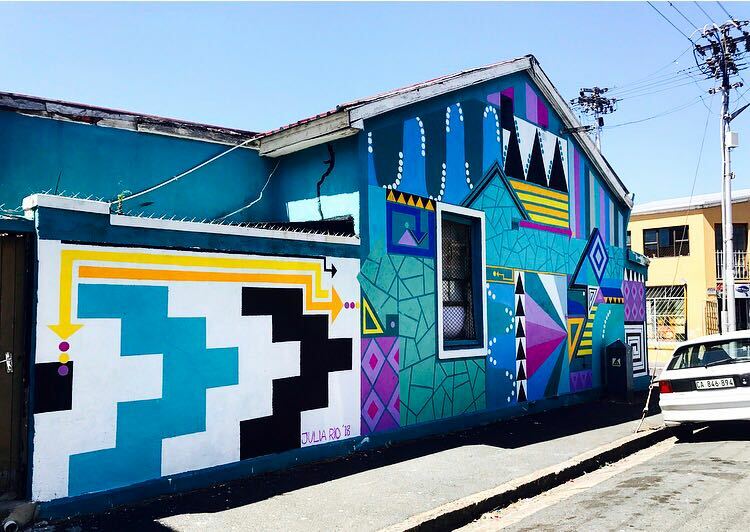 Julia has always been a big admirer of street-art, and after completing her first yarnbomb in the streets of London 2013 , her creativity sought out more of this type of expression. Her street art soon evolved into painting colourful murals inspired by warmth, geometric shapes, movement and the harmony she feels when in the Swedish forest. Her piece for the International Public Art Festival “You, me & the sea” is symbolic for the life bearing properties of water. Firstly, the background colour being turquoise embodies life giving water from the most coveted beaches, streams and rivers around the world. Secondly the redundant use of triangles pays reference to the more godlike qualities of water. In the study of alchemy, an inverted triangle symbolises water which is said to be the source of all life. “You, me & the Sea” by Julia Rio. Salt River, South Africa. IPAF February 2018. Through her participation in the festival Julia has realised how privileged she has been concerning water and how much she’s been taking it for granted. 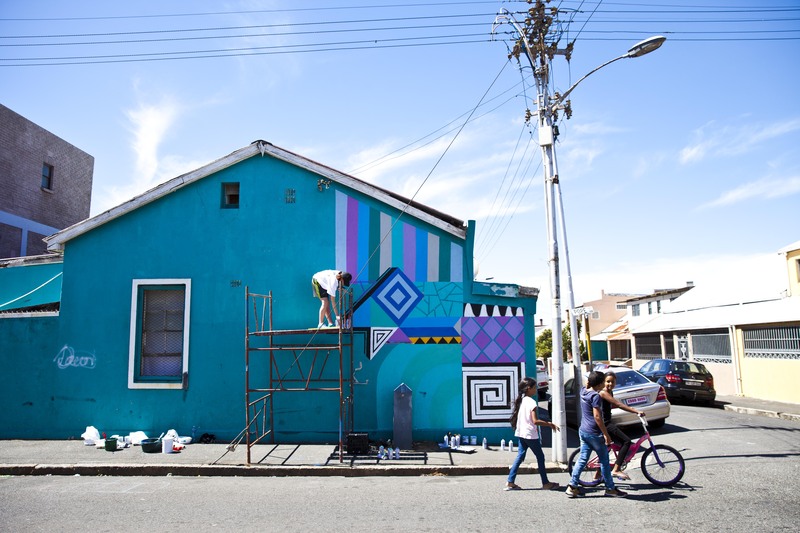 Her intention with her mural was to bring to life the old African philosophy “Each one teach one” by using public art as a means to educate even the most noblest citizens being children about the significance of water in our daily lives. She believes that water education is key when it comes to conservation. 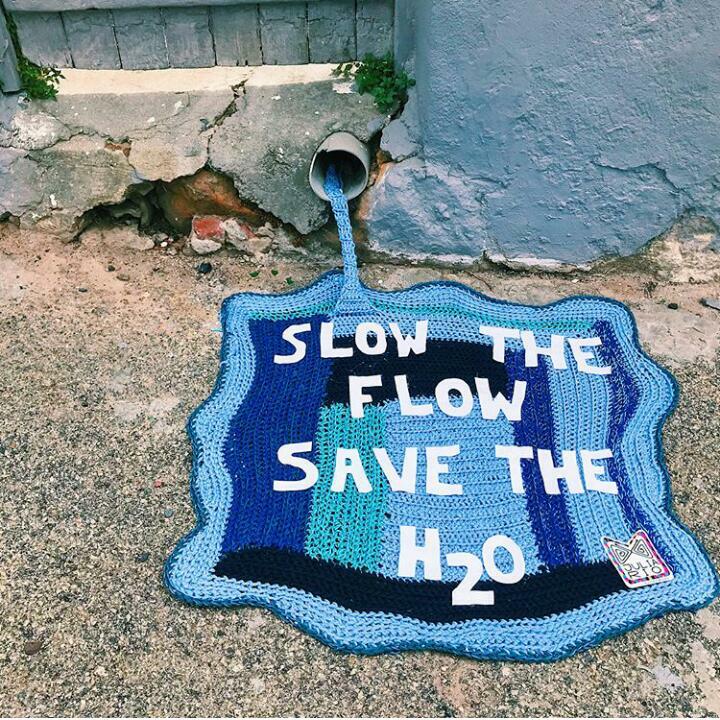 Alongside her mural, Julia created a yarnbomb resembling running rain water from the gutter with the inscription “Slow the flow! Save the H2O!”. Julia was ever so happy to be part of the festival using creative approaches to engage society on the importance of H2O.